In a small bowl, blend raspberries using an electric hand mixer on low until raspberries start to mash. Then turn speed up to medium and mix until raspberries form a puree. Set aside. Rinse beaters. In a separate bowl, combine coconut butter, coconut oil, maple syrup, and vanilla, and using same electric hand mixer, blend until ingredients form a whip. Add raspberry puree and blend until smooth. Pour into an 8 x 8 inch glass dish and chill covered in refrigerator for about two hours. If adding chopped nuts, sprinkle over the top of the mixture just prior to placing in the refrigerator. Press toppings down with a spoon, if necessary, so they set into the fudge as it chills. 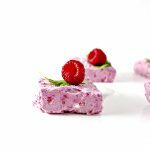 If the raspberries are too tart for your liking, then add a little granulated or liquid stevia to them, if desired. Or add a little extra maple syrup to the mixture for added sweetness. Additionally, you can top your fudge with chopped walnuts or pecans just prior to putting the fudge in the fridge to set. It tastes like CAKE! So yummo!